This Steinway & Sons Model B Grand Piano is in a Louis XV Rococo case style. The art case cabinet is in a gorgeous Circassian walnut with a stunning grain detail. Built during the golden era of Steinway Factory quality, this rare 6’11” instrument has undergone an extensive restoration process. Featuring a stunning art case cabinet, the original Steinway Factory soundboard, reconditioned pinblock and a fully rebuilt action utilizing Genuine Steinway Hammers. The piano’s action has been fully regulated and concert level tone regulation has been performed. This piano truly is a work of art both visually and as a world-class musical instrument. This piano has been sold to a private client in Dubai, UAE. Seeking a similar piano? Click here. This gorgeous Steinway & Sons Model B Grand Piano was crafted at the New York Steinway Factory during what is considered by many to be the company’s true golden era of quality. [The serial number indicates a manufacturing date of 1917, however, records indicate the piano was finished and shipped to Steinway dealer Lyon & Healy in Chicago in December of 1916.] First introduced in 1878 and long considered to be a near ‘perfect piano’, the Steinway Model B has become the favorite instrument of countless professional pianists. This particular, exquisite Model B is a true feast for the eyes and ears. The ornate Art Case cabinet styling is done in a Rococo, Louis XV style. [Known officially as Sketch No. 501A.] The case features delicate scroll work and hand carved detailing and is covered in rich Circassian Walnut. This beautiful woodwork extends to the matching bench as well. The overall design and quality of the woodworking on the instrument’s case is breathtaking. 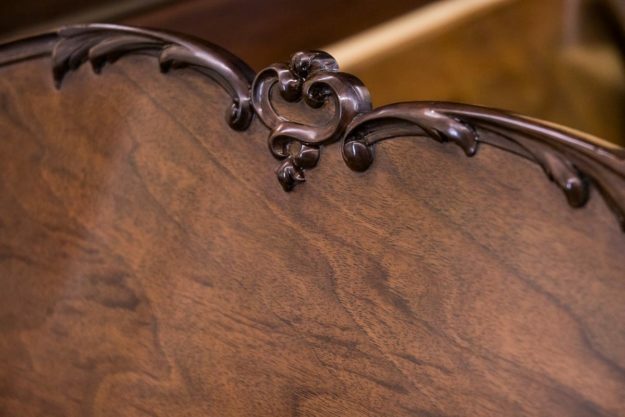 This piano features an extremely rare Circassian Walnut cabinet with a deep, beautiful grain pattern. This wood is very popular due to the distinctive and elegant look. Used extensively in the past for everything from furniture to gun stocks, this wood has seen a decrease in supply and is quite rare to find in use today. The original brass hardware has been polished and new solid brass casters have been installed. This piano features the original Steinway Factory soundboard which has been restored. The piano’s action has been fully rebuilt with genuine Steinway hammers, new shanks and flanges and German Renner Wippens. The original two piece ivory key tops have been expertly restored by our head ivory restorer and the cabinet scroll detailing is in excellent condition. The elegant design of this art case piano was typical of turn of the century styling and is still as stunning today as it was a hundred years ago. This art case piano will be a unique and eye-catching musical centerpiece to any room it is placed in. This piano commands respect both as a work of visual art and as a wonderful musical instrument. Expert action and tone regulation/voicing was conducted to ensure a responsive touch and a rich quality of tone. We spend many extra hours beyond the industry norm to ensure the piano you receive is one that is of true concert-level quality. This Steinway & Sons Model B Grand Piano is one of the finest Art Case Steinways we have available today. Chupp’s Piano Service technicians have the skills needed to complete the needed refinishing and rebuilding. We specialize in premium Steinway piano restoration and our work is of the utmost caliber to ensure this fine instrument returns to its former glory. This art case piano will be fully rebuilt to premium concert standards and is sure to please any discerning concert pianist. Contact us for audio/video samples or an appointment! This fully rebuilt vintage Steinway & Sons Model B Grand Piano #180473 comes complete with a Five Year Warranty from Chupp's Piano Service. Steinway Model D Concert Grand Pianos are the standard by which other concert pianos are judged. This very rare and stunningly gorgeous Rosewood Steinway & Sons D #52626 was manufactured in 1884 at the New York Steinway factory. Fully restored, this piano features a new solid spruce soundboard, fully rebuilt action, original ivory keytops and much more. This piano's art case cabinet is in a figured Brazilian Rosewood veneer that is sure to make it a visual and musical centerpiece in any room it is placed in. Measuring just under nine feet in length, this concert grand piano is a fine example of golden era piano craftsmanship. Includes the original matching stool. A beautiful example of Steinway & Sons' legendary craftsmanship, this fully restored Model D Concert Grand Piano possesses all of the qualities expected of a performance level concert grand. Measuring in at just under nine feet in length, this unique piano has undergone a premium rebuilding process. Featuring a Western Red Cedar Soundboard, this instrument was crafted during Steinway's 'golden era' of high quality and innovation. This piano features an incredible sound and a fully regulated, expressive, responsive action. There is a reason that over 90% of concert pianists continue to choose to perform on Steinway instruments. Pictured with an optional Jansen Adjustable Artists Bench. This piano was selected for Cedarville University in Ohio by Steinway Artist Dr. John Mortensen. Ready To Restore: This vintage, 1900 Steinway Model B was manufactured during Steinway & Sons’ golden age. Featuring a regal and distinctive African Flame Mahogany veneer on a Victorian Style Art Case design, this concert level instrument is in excellent structural condition and is a perfect candidate for a full restoration. This piano is in 'ready to restore' condition and can be refinished in your choice of either mahogany or ebony. Steinway & Sons Model B Grand Piano #433635 was built in 1973 at the New York Steinway Factory and is in a satin ebony cabinet finish. Measuring just under seven feet in length, this parlor grand piano is in excellent original condition and features the original Steinway soundboard, genuine Steinway action parts, and much more. Contact us if you have any questions or would like to set up an appointment to see our facilities and the world-class pianos we have in stock. Currently located at our New Paris, IN. Piano Rebuilding Facility. Error: Error validating access token: Session has expired on Thursday, 10-Jan-19 19:00:02 PST. The current time is Wednesday, 24-Apr-19 22:54:56 PDT.